BEETxBEET is a Los Angeles based clothing company that produces a range of ethically made T-shirts, headwear, and accessories. The brainchild of Jacky Wasserman, a graphic designer, vegan, and DJ living in LA. BEETxBEET brings together her life’s passions of design, food, and music. Founded in 2014 BEETxBEET started as a dream that soon became a reality. On her website, Jacky wrote a post about what inspired her to start her own clothing company. Originally, Jackie was addicted to mac & cheese and didn’t put much thought into what was going into her body. But after watching various documentaries on Netflix, including the famous Vegucated, Forks Over Knives, and Food Inc, Jacky quickly changed her eating habits. It was around this time that she started to realize all the pain and suffering that was going on behind those closed doors. Not willing to sit back and let it happen, Jacky decided to do something about it in her own way. Initially it started off with changing her overall lifestyle including her diet. Instead of eating her mac & cheese that she absolutely loved, Jacky started to learn vegan recipes and test them out in the kitchen. In addition to all of that, she also started to research the latest topics on things happening in our environment and researching how animals are treated. The more information she read and discovered, the more Jacky wanted to help make a change in the world. She became so passionate about it that she finally set up her own business that combined her two loves: graphic design and veganism. With her clothing brand, Jacky aims to spread awareness about all things healthy in the world. Before she became a vegan, she had a huge stigma attached to what she thought being vegan meant or looked like. Looking back she can see why people view them as hippies and tree lovers, but it’s only when she became one that she realized how wrong she was. Jacky now aims to spread healthy vegan propaganda while educating the general public about conscious eating and environmental impacts. By spreading her knowledge and statistics, Jacky hopes to open the eyes of other individuals. To help spread the awareness of veganism, Jacky, and her company regularly donate to non-profit organizations around the world. Whether this means donating money, time, or volunteering, Jacky and her team do it all for the greater good. Some organizations that they’ve contributed to in the past are Mercy for Animals, Truth or Drought, and Farm Sanctuary to name a few. BEETxBEET is just one of the hundreds of vegan brands out there trying to do their bit for animals. If you want to help give a voice to those that don’t have one, then supporting these cruelty-free brands is the best way. Discover a whole range of awesome vegan T-shirts and brands that work hard every day to help animals live in peace. 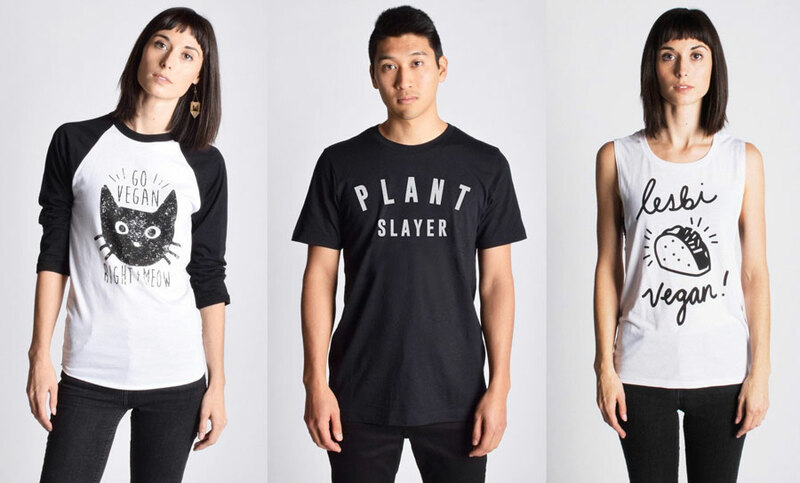 Throw out your old wardrobe and make sure it’s 100% vegan-friendly by collecting all of these awesome shirts.